A flashback reveals how the Super-Elite aliens of Hamilton County had come to be indoctrinated to Manchester Black's cause. Kathy and Cobb seem more and more reluctant as Black's plan progresses. Meanwhile with Lois recovering, Superman reluctantly leaves her behind to confront these strange new foes but when he returns he discovers Jon and his manipulator Black. Clark is understandably angry but everything he does seems to push Jon away. 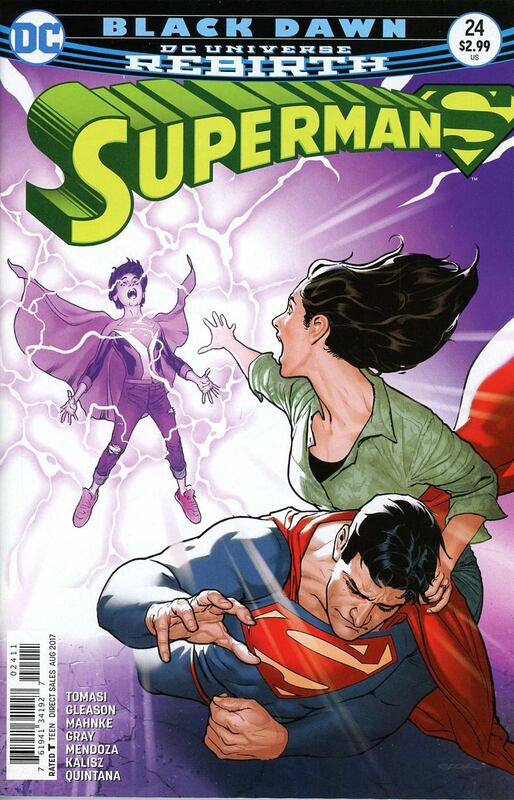 When Kathy and Cobb switch sides and help Clark to rescue Frankenstein, The Bride, Batman & Robin things seem to be changing for the better until an angry Manchester Black corrupts Jon into Superboy Black and the Boy of Steel, along with the remaining Super-Elite, vow to kill them all. Story - 5: This story has been rumbling on for a while and has been throwing in some big twists and turns as the mystery of Hamilton County has continually escalated. I avoided the spoilers to allow the story to play out and it worked in my favor as I never would have put this all down to Manchester Black. I am also unsure as to Lois' fate, the media suggested her leg had to be amputated but there hasn't been a mention since then, except for that saddened look as Clark flies away. I'd grown to like Kathy as a character so I'm glad she and her grandfather aren't a completely lost cause. Aside from the mass of reveals, we have the corruption of Jon Kent. I am keen to see where this goes especially now we have two teams fighting it out for his fate. The catch up between Superman & Action Comics is something I hope they fix soon. Art - 4: I am a long term protester of artists flipping the art chores back and forth and this issue is a prime example as to why. One or the other, not both, as they are just too different and divert the feelings evoked by one in the opposite direction of the other. To be honest either would have worked but coupled together they seem to fight one another. If I had to choose I think it should have been Doug Manhke on the entire book. Cover Art - 5: I think the right phrasing for this is 'hits you right in the feels'. I'm old and a Brit so wholly unqualified to use it, but seeing poor Jon overtaken by dark forces and his parents powerless to help him is a powerful image and something many parents fear when bringing up their children. Aside from the emotional turmoil Sook has delivered a powerful image that works extremely well with the theme and is rendered beautifully with a soft fade palette. 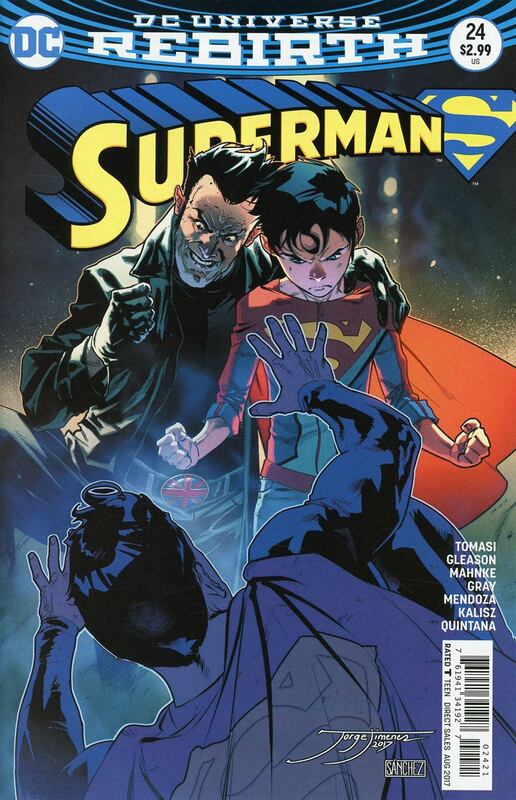 Variant Cover Art - 4: Not as powerful an image as Sook's but Jimenez definitely delivers a variation focusing on the menacing Manchester Black and his dark influence over poor Jon. It also brings up the question of what Superman would do in this situation... The covers this week are extremely powerful.